Passionate lyricism, bone-rattling power chords, rustic charm, chilling non-sequiturs, quiet introspection, rollicking humor, colorful tone-painting, exhilarating virtuosity – the chamber music of Lawrence Dillon has all of these things and more. The fact that this seemingly limitless font of ideas comes to us in brilliantly conceived reexaminations of traditional forms makes the accomplishment of this music all the more remarkable. 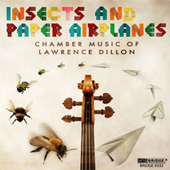 Insects and Paper Airplanes brings together the second (written in 2002), third (written in 2005) and fourth (written in 2009) components of the Invisible Cities String Quartet Cycle, a set of six quartets Dillon has been working on since 1998. Through them, the composer takes a fresh look at the familiar forms of fugue, aria and rondo, subjecting each to multi-dimensional scrutiny, like a jeweler carefully examining every facet of a freshly polished diamond. Though Dillon’s mastery of formal principles is remarkable, it shouldn’t be allowed to overshadow the fact that he has managed to uncover and illuminate a small multitude of tiny truths that define contemporary life. These are works that speak to the ages through the circumstances of our times. The first movement opens with a double canon, with cello and viola leapfrogging one another on a rustic pedal tone, while the violins lift a boisterous melody through the circle of fifths. The rondo that follows makes liberal use of a repetitive rock-and-roll progression, spinning it through several permutations. A comically unwinding transition that evokes a wheel spinning to a halt takes us to a ghostly nocturne, a three-voice round that once again rises through the circle of fifths. The movement concludes with an exuberant fugue/rondo, in which each new voice enters with the subject at a faster tempo than the previous. The second movement opens with an ethereal round that never quite makes it back to the beginning of its cycle – another example of Dillon’s approach to the concept of the “infinite sphere.” The rondo that follows is a compressed version of the first rondo, bringing back the pulsating repetition of a rock bacchanale. The piece concludes with an expanded version of the first round, in which the opening melody and its inversion loop through the circle of fifths in a joyous affirmation of the eternal life cycle. String Quartet No. 4: The Infinite Sphere was commissioned by the Daedalus Quartet and the Thomas S. Kenan Institute for the Arts. It was premiered by the Daedalus String Quartet at Wolf Trap in Virginia on January 15th, 2010. String Quartet No. 3: Air, true to its name, is the most evanescent of the cycle. An homage to the Italian da capo aria, it adheres to the outline, substance and spirit of operatic song, with a single-movement in five symmetrical sections: Aura-Aria-Air-Aria-Aura. An ethereal introduction — Aura — is followed by a lyrical Aria, sung by the violins and viola in a unison that is constantly on the verge of splintering into fragments. The tune seems to come in and out of focus, as the three instruments ornament the line melodically, rhythmically, temporally and timbrally. The contrasting section, Air, ranges from delicate breezes to raging tempests. Then the Aria returns, sung by the cello, with a fragile accompaniment that mimics the shape of the human breath. String Quartet No. 3: Air was premiered January 13th, 2006 by members of the Four Seasons Chamber Festival in Greenville, NC. In String Quartet No. 2: Flight, Dillon conflates two definitions of the word “fugue”: the musical composition and the idea of flight itself. Each of the six movements uses fugal procedures; each also focuses on a specific aspect of flying. Although many compositions throughout the ages have imitated bird song, the flight of birds has seldom been captured in music. To launch themselves into the air, birds use their leg muscles in conjunction with flapping their wings. On each downstroke, the tips of the wings twist forward while the rest of the wing remains level. Once airborne, most birds alternate the flapping of their wings with soaring, or riding the prevailing air currents. Creating a musical equivalent to bird flight required the composer to come up with a novel approach to fugue-writing. The subject, rather than being played by a single instrument, is a gesture that results from the blending of all four instruments. As the subject passes through different key centers, “countersubjects” are added in the form of solo figures stated by individual instruments. The result sounds like a primordial fugue: fugal procedures are discernible in their broadest outlines through a colorfully evocative texture. The natural kinship between a wing and a bow arm finds expression in the coda, in which each instrument relaxes into a gentle swaying motion between two double-stops. The darting, buzzing flight of insects is the subject of this scherzo, which is marked “Very fast and a little obnoxious.” By contrast, the trio section is a whimsical enactment of paper airplane flight: lazy, chaotic, and ultimately doomed. The insects return with renewed fervor, only to be summarily dispatched by the cellist. Stars don’t fly in any literal sense of the word, but their gradual emergence and distant traversal of the night sky never fails to promote quiet introspection. This third fugue features a two-voice subject and concludes with a shimmering, six-voice stretto accompanying a serene, floating cantilena in the first violin. In 1903, the US Army gave Samuel Pierpont Langley an enormous sum of money to build a steam-powered aerodrome. Huge crowds of onlookers and reporters gathered at the launching site: a tall scaffolding mounted on a houseboat. The engine gradually built up tremendous power, creating an increasingly deafening sound — before the aerodrome dropped off its perch and fell straight down into the Potomac River. The fourth fugue and second scherzo of Flight literally and humorously depicts this big buildup and collapse, starting with an accelerating, two-voice subject and ending with a few muffled burbles. The fifth fugue, which the composer has called “an evocation of playground swingsets,” is a tribute to flights of fancy, especially the peacefully unselfconscious dreams of children. It segues directly into the sixth and final movement. String Quartet No. 2: Flight was premiered at the Reynolda House Museum of American Art in Winston-Salem, NC by the Daedalus String Quartet on November 20th, 2003. Of all the works on this recording, What Happened has the most traditional, yet least rigorous, design. The three movements suggest a commonly found paradigm – fast-slow-fast – and yet the work unfolds in a curious manner. The first movement, as long in duration as the other two combined, outlines` an extended sonata form. The second movement is an oddly resonating anthem, with choir and accompaniment stubbornly refusing to keep pace with one another. The third movement is a quirky gallop, as though dancing on two left feet. Each of these last two movements features a sudden, powerful interruption, a moment of unhinged chaos, after which the music tries to reassemble itself before drifting into silence. The puzzling shape of these movements, and of the overall work, reflects the riddle of the title: is What Happened a statement or a question? What Happened was commissioned by the Atlantic Ensemble and premiered at the Maison Danoise in Paris, France on May 26th, 2005.